IntroductionThis Guide is also available in an Italian version. Questa guida Ã¨ disponibile anche in lingua italiana.CD-DVD Speed is a software designed to execute a number of tests to verify optical drives (both burners and readers) functionality and to determine burned media quality. With every update, other than bugfixes, can be introduced some new functionalities and changes in user interface, so it’s necessary to do now some clarifications. When I wrote this guide, latest official version available was 4.51.1, and I used this version to execute all tests and create pictures published in this guide. Recently, on September 2006, the new version 4.60 was released. To avoid repeating again all tests every time a new version is released, I decided that is easier and faster leave this guide as is, adding at the end of this guide anything necessary to cover new features and updates. Anything described here, even if pictures are not referred to latest version, is valid also for latest version available on official CD-DVD Speed website. CD-DVD Speed is an apparently light software (a standalone executable with file size of only 1.38 MB), but it allows the user to execute many different tests, so it can be a little intimidating for a new user to read all parts of this guide. I’ll try to maintain the discussion as simple as possible, with only few technical details, because this guide is aimed at the novice user not the expert technician, who already knows this software in all it’s parts. The main purpose of this guide is to describe CD-DVD Speed in all it’s parts, not to describe in a detailed way the tests that it allow to do. In this guide tests will be described only in a superficial way, but those who are interested interested can find a lot of information in the CD Freaks forum. [/li][li]Menu: Help[/ol]First parts of the guide, from 1 to 10, are exclusively descriptive, i.e. are only a list of all parts of CD-DVD Speed and of all available functions. Each available function and its significance (described in a simple way only) will be described in the second part of the guide, from 11 on. A last consideration is related to the pics of this guide. I created all images executing all tests described, except some special tests that I wasn’t able to execute because they require some special equipment that I don’t own. For this I must thank two moderators of CD Freaks: Eltranquil (who did all tests with A-BEX discs) and Dee-27 (who gave me some pics of overburning tests done with DVD media). I hope that this guide can be useful to all users that want to use this great software. CD-DVD Speed is freely downloadable from its webpage and is contained in a ZIP archive. The first thing to do is extracting the executable from the zip file in a folder. The user can choose any folder, because CD-DVD Speed doesnâ€™t require installation, but it’s a standalone executable. Main window contains various elements, that will be described in detail. Right below the menu bar there is CD-DVD Speed’s logo. On the right there is a Combo Box from which is possible to select the drive to be tested. In this example, there are three optical devices connected to the computer, all listed in this box. [B]Important[/B]: In this box CD-DVD Speed shows not only what drives are present in the computer, but also [B]the exact drive model[/B] and [B]the firmware installed[/B] in each drive. The red square shows drive model, and the green arrows show the firmware installed in each drive. This button allows you to open the window containing the global options of CD-DVD Speed. Finally, on the right there are two buttons, “[B]Start[/B]” and “[B]Exit[/B]”. When a test is running, the “[B]Start[/B]” button changes it’s name and becomes “[B]Stop[/B]”. Its function is pretty intuitive: it allow to interrupt a test if the user decides to do it. In the window upper bar is showed the name and the version of the software. In the right there are two other little buttons. The button showed in the pic with the number [B]1[/B] is for “[B]Clipboard Copy[/B]”. Pressing this button, all the content of the main window is copied in the clipboard as a picture, and can be pasted in any graphic software (like MS Paint for example) to allow any modification the user wants to do. The button showed in the pic with the number [B]2[/B], with the little floppy disc, is for “[B]Save[/B]” the main window appearance on hard disc. Pressing this button opens a “Save as” dialog window asking where image must be saved. [/li][li][B]Tagged Image File Format[/B] (.tiff). [/ul]For practical uses, the best format (and the one I strongly suggest) is [B]PNG[/B]. Images saved in PNG format have a better quality than JPEG, but differently from BITMAP and TIFF file dimensions are much smaller. To post in the forum it’s the best choice. [B]BEWARE[/B]: the image must be saved before to removing the media from the drive. If image is not saved, when media is removed the pic will be deleted. So to avoid to losing anything, remember to save first, and then remove the media. Clicking with left mouse button on each tab it’s possible to open the five main sections of CD-DVD Speed. Each section is aimed at specific functions, and for convenience each section will be described in the following parts of this guide. The last element of the main window is a text box that show to the user various information on the current executing test. In this picture the box is empty, but we’ll see in detail that during a test execution there will be some information. Right above the text box there is a bar that show the progression of the running test. To open the options panel, it is sufficient to click in the little button with gears near the “[B]Start[/B]” button. Alternatively, it’s possible to go to menu “[B]File[/B]” and select the command “[B]Options[/B]”. The options window is organized in sections, listed in the left panel. Each section contains a group of specific options. Let’s see in detail each option’s group. This first group allows you to customize the main interface of CD-DVD Speed specifically regarding colors and language. CD-DVD Speed was translated in various languages. To change the language, it’s sufficient to select the preferred one from the combo-box. [/li][li]Book Type[/ol]Selecting “[B]Disc Type[/B]”, CD-DVD Speed will show the type of the disc loaded in the drive. Selecting “[B]Book type[/B]”, CD-DVD Speed will show the book type of the disc loaded in the drive. DVD media are available in different standard formats: +R/RW ("[B]Plus[/B]" media), -R/RW ("[B]Minus[/B]" media), RAM (a rewritable media different from the previous formats), and ROM (know also as “[B]Pressed[/B]” discs). Recently introduced were also other disc standards, know as Blu-ray and HD-DVD. These media are still under development, and will not be included in this guide. Here is sufficient to know that according to the option selected, in the main window of the “[B]Benchmark[/B]” tab will be shown a different information. The “[B]Book Type[/B]” is an information localized in discs that is read by optical drives anytime a disc is loaded. This information is necessary to the drive to know how that media must be used. More details are in the section “Menu --> Extra --> Bitsetting” of this guide. More details can be found also in Wikipedia. Right now is sufficient to say that when a +R/RW media (the only media in which booktype can be modified) is loaded in the drive, the disc will be showed as what it is actually (when the option “[B]Disc Type[/B]” is selected) or as the drive “sees” that media (i.e. as ROM if the option “[B]Book Type[/B]” is selected and if the booktype was changed during the burn of that media). This option allows to change the priority of CD-DVD Speed. Each process running in Windows is executed with a different priority regarding the access to computer resources (CPU usage, memory access, etc). According to the option selected, CD-DVD Speed will be executed with a different priority. This option was added starting from version 4.50, so in previous versions changing priority can be done only manually, using Windows Task Manager. Set priority to the value “[B]High[/B]” it is possible to avoid interferences during test execution by other processes running in the same time on the computer. For example, surfing on the web when a test is running could cause some false results, but by setting priority as high these interferences can be reduced almost completely. Obviously, is anyway it is preferable to avoid using other programs when a test is running, particularly tests that heavily access the HDD (like an antivirus scan) or that extensively use CPU (like a video encoding). These settings allow to change colors of main window. [B][U]Theme[/U][/B]: CD-DVD Speed contain four themes, i.e. four predefined combinations of colors of the main window. The user can select a theme or can manually select colors according what he/she likes. [B][U]Important[/U][/B]: If the user wants to manually select colors, first of all it is necessary to select the “[B]Custom[/B]” item from the combo box list, or any color selected will be ignored. [U][B]Background 1[/B][/U]: the background color of the window in which graph will be plotted. [B][U]Background 2[/U][/B]: the background color can be uniform or can be shaded. Selecting this option, background color will be shaded between two colors, the one selected in the “[U]Background 1[/U]” item, and the one selected here. Unchecking this option, background color will be uniform, the one selected in the “[U]Background 1[/U]” option. [B][U]Speed[/U][/B]: the color of the line expressing speed (reading or writing speed according to the selected test). [B][U]Buffer level[/U][/B]: the color of the line expressing buffer level when burning. [B][U]RPM[/U][/B]: the color of the line expressing disc rotation speed. [B][U]CPU usage[/U][/B]: the color of the line expressing CPU usage when burning. To make easier reading of the graph, it’s possible to plot a grid, and the user can select grid colors. [B][U]Grid (primary)[/U][/B]: the color of primary grid. [B][U]Grid (secondary)[/U][/B]: the color of secondary grid. [B][U]Show horizontal grid[/U][/B]: if this option is checked, in the graph will be plotted also horizontal grid. [B][U]Show vertical grid[/U][/B]: if this option is checked, in the graph will be plotted also vertical grid. If both show-grid options are unchecked, the graph will not contain any grid. All these colors can be modified by the user in the preferred way, but it’s important to consider that colors can’t be selected randomly, because resulting graphs can be unreadable. For example a yellow line on a white background will be hardly visible. My suggestion is to use the color theme used in the picture. In this window there is a list of all available standard tests that can be done with CD-DVD Speed. In this section will be described only the options panel, and test discussion will be done in the “[B]Basic Tests[/B]” section of this guide. In this panel the user can select which tests will be automatically executed pressing the “[B]Start[/B]” button in the “[B]Benchmark[/B]” main window. It’s also possible to run each test individually, even tests not selected here in the global options of CD-DVD Speed, selecting it from the “[B]Run Test[/B]” menu. Default setting is all tests selected, but user can change this how he/she likes. Before a test can be executed, CD-DVD Speed start a disc rotation for a while. This is important to stabilize disc and drive. It’s like a car, when a driver leaves his/her engine running at minimum for a while he/she sets off. Default setting is 10 seconds, but it can be changed by user. Sometimes, for example, it occur more than 10 seconds for a drive to reach full rotation speed. CD-DVD Speed allows you to select both reading and writing speed. [B][U]Read speed[/U][/B]: This is the speed that CD-DVD Speed use to execute the “[B]Transfer Rate Test[/B]”. I suggest the use of “[B]Maximum[/B]”, because in this way the drive and/or discs will be tested in the worst conditions. If a drive is able to read correctly a disc in the worst conditions, then it’s a high quality drive. The same can also be applied also to burned media. If a disc is readable under the worst conditions, then burning was successful. [B][U]Maximum[/U][/B]: maximum speed that the drive can reach. [B][U]Current[/U][/B]: current speed. CD-DVD Speed does not modify speed in any way. Speed will be determined by other system settings (drive firmware settings, softwares running in background like Nero Drive Speed or Plextools, etc). [B][U]Selected[/U][/B]: speed is selected manually by the user. [B][U]Write speed[/U][/B]: This setting requires a special consideration. In CD-DVD Speed versions previous to 4.50, a writing test can be executed only in the “[B]Benchmark[/B]” window. Starting from version 4.50, writing test can still be done from the “Benchmark” window, but a new way has been introduced a new way to do the writing test. This test will be described in detail in the dedicated section of this guide. In this panel of CD-DVD Speed global options, the “[B]Write speed[/B]” value is referred to the “classic” test executed in the “[B]Benchmark[/B]” window, i.e. is the speed at which the disc will be burned in the “[B]Create Disc Test[/B]”. This setting has no influence on the writing speed of the “new” Create Disc Test. These settings are specifically referred to the Transfer Rate Test (TRT) of the “Benchmark” window. In this panel can be modified settings relative to graph drawing. [B][U]Test Length[/U][/B]: This slider allows the user to select accuracy of TRT. The user can select if he/she wants to do a fast or an accurate test. A higher accuracy will show a more detailed graph but the test will take longer. My suggestion is to select max accuracy, because the main purpose of TRT is to test readability of burned media. in the TRT graph the disc rotation speed will also be shown. If this option is unchecked, TRT will not show the disc rotation speed. [B][U]Maximum Speed CD[/U][/B]: this setting allow the user to select the maximum value displayed in the graph scale when a CD media is inserted in the drive. I suggest to insert a value a little higher than max read speed of installed drives, to avoid that a segment of the curve could be drawn on the window margin. For example, for a drive able to read up to 52x speed, I suggest a value of 53 is inserted. [B][U]Maximum Speed DVD[/U][/B]: this setting allows the user to select the maximum value displayed in the graph scale when a DVD media is inserted in the drive. Again, I suggest the user inserts a value a little higher than max read speed of the installed drives, to avoid that a segment of the curve could be drawn on the window margin. For a 16x drive, I suggest a value of 17 is inserted. [B][U]Show minimum/maximum[/U][/B]: If checked, this option will show in benchmark window minimum and maximum values of speeds recorded in Transfer Rate Test (TRT). If the curve is regular, minimum value will be the start speed, and maximum the end speed. If the curve is irregular, minimum value will be the lowest speed recorded, and maximum the highest value reached. [B][U]High resolution graph[/U][/B]: This setting allows to select whether graph must be drawn at low or at high resolution. This option can be set both for read and for write tests. I suggest to select both these options to have a clearer image of test results. In this section can be changed writing options. It’s possible to select the writing method, to do overburning, how much to overburn, and to set other burner options. [/li][li][B]TAO[/B] (Track At Once)[/ul]Here it’s possible to select writing mode when CD-DVD Speed do a create disc test. Default setting is [B]SAO[/B]. In SAO mode can be selected also the so-called “[B]Overburning[/B]”, i.e. to write more data than the official capacity of the disc. 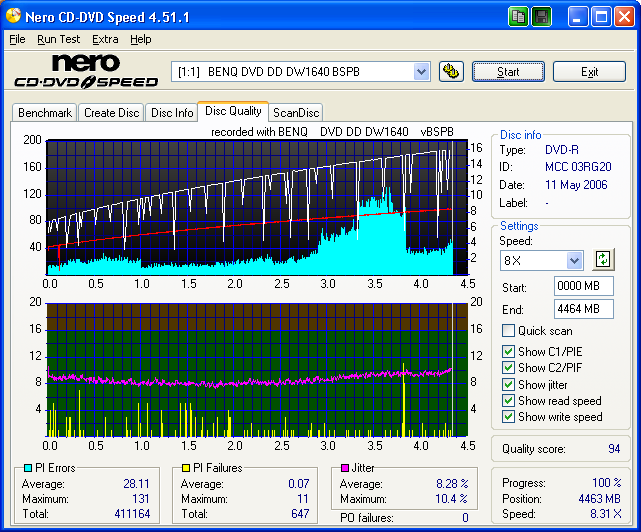 Selecting this option, CD-DVD Speed will write on the disc the exact amount of data specified in the box (see the red arrow). [B]Beware[/B]: not all burners supports overburning, and writing in overburning can damage the drive. Moreover, to do overburning is better to use special suited media, or data can be unreadable. [B][U]Disk type (Simulation only)[/U][/B]: Some drives can do simulated burnings, i.e. do a burn without writing anything on the disc. You can choose to simulate writing an audio or a data disc. [B][U]Buffer underrun protection[/U][/B]: Checking this option, will be enabled the drive’s buffer underrun mechanisms if available. These allow to interrupt burning process if drive buffer is empty, and to resume burning when buffer is again full. By unchecking this option, buffer underrun mechanisms of the burner will be disabled. [B]Important[/B]: it is recommended to leave this option checked when testing the write performance for Z-CLV write modes. [B][U]Write and verify[/U][/B]: This option is related with RAM media writing. Checking this option, writing of RAM discs will be done with the verify option on, i.e the disc is checked during the burn, and if there are errors, the wrong sectors of the disc are written again. If unchecking this option, there will be no verification during the burning, and the writing time will be shorter. [B][U]Burn image file[/U][/B]: Again there is an important consideration: this option is related only with the writing test done in the “[B]Benchmark[/B]” window. Checking this option, CD-DVD Speed will run the “Create Disc Test” burning an image file created by user (ISO or NRG). Unchecking this option, the “Create Disc Test” will burn on the disc binary data up to the full disc capacity or up to the value selected by user if “Overburning” was selected. [B][U]Include test data[/U][/B]: Checking this option, besides binary data or image file, CD-DVD Speed will also burn on the disc also some additional data: the drive used to do the burn, installed firmware, and burning graph. This information can be seen in the “[B]Disc Quality[/B]” test graphs. This can be useful to interpret scan results. Unchecking this option prevents the saving of these additional informations on the burned disc. Checking this option can be useful because sometimes error spikes in scans are related, for example, with buffer emptying during burn. In this way it’s easier to find what can be the cause of a group of errors on a burned media. These settings are related specifically with the “Access/Seek Times” test. [B][U]Measure[/U][/B]: Here the user can select what test must be executed. Possible choices are “[B]Seek Time[/B]” and “[B]Access Time[/B]”. We’ll see in more detail what these tests are aimed in the relative section of this guide. [B][U]Number of operations[/U][/B]: Here the user can select how many times to execute measures of previous selected parameters. These settings are related with file saving. [B][U]Autosave[/U][/B]: Checking this option CD-DVD Speed will save automatically all test results. Files can be saved in different formats, and the user must select how to save files. Possible choices are two: “[B]Binary[/B]” (file extension .CSV) or “[B]HTML[/B]” (file extension .HTML). [B][U]Include Status[/U][/B]: Checking this option CD-DVD Speed will save not only graph but also all informations contained in the little window under graph, i.e. test name, start time, end time, etc. [B][U]File Name[/U][/B]: In this section user can select file name that CD-DVD Speed will use if “Autosave” option is checked. [B][U]Show file dialog[/U][/B]: By checking this option CD-DVD Speed shows a “[B]Save as[/B]” dialog window to ask the user where save files. By unchecking this option, all files will be automatically saved in the default folder or in a user defined folder. To create an user-defined folder, it’s sufficient to press the little button showed by arrow. On the left of the button there is the selected save folder, in our example “[B]K:\CDFREAKS[/B]”. [/li][li][B]%I[/B] - MID, i.e disc mediacode. [/ul]According to the parameters used, a file name will be generated automatically, and it’s possible to see a preview of the filename created (see the red square). If the “[B]Show file dialog[/B]” option is [U]checked[/U], the user can manually modify filename. If “[B]Show file dialog[/B]” is [U]unchecked[/U], results will be saved with the file name automatically generated according to parameters defined by user. To avoid file overwritings, I suggest to insert also date and/or hour ([B]%D[/B] and [B]%T[/B]), in this way it’s highly improbable that two files can have the same automatically generated name. Alternatively, the user can manually change the file name. If in the textbox is not inserted any value, file name can’t be generated automatically, and must be inserted manually by user. These settings determine how CD-DVD Speed will execute the tests. [B][U]Start selected tests automatically[/U][/B]: Checking this option, CD-DVD Speed executes automatically all selected tests in “[B]Standard Test[/B]” panel immediately after a disc is inserted in the drive. Unchecking this option, tests must be started manually by user. [B][U]Delay between test runs[/U][/B]: How much time CD-DVD Speed must wait between each test run. [B][U]Number of test runs[/U][/B]: How many times CD-DVD Speed must execute all selected tests. [B]Important[/B]: Selecting “[B]zero[/B]” as a value, all tests will be executed indefinitely until the user stops manually. So be careful to set these options. These options are related to “[B]Disc Quality[/B]” test, often called also disc scan. [B][U]General[/U][/B]: These settings allow to select some general options on Disc Quality test. [B][U]Detect speed settings[/U][/B]: Quality Test can be executed at different speeds. These speeds vary according to the burner model and firmware, and are retrieved by CD-DVD Speed every time that the “[B]Disc Quality[/B]” tab is selected in the main window. If this option is checked, CD-DVD Speed will automatically retrieve this information. If this option is unchecked, available speeds must be retrieved manually by the user (see Disc Quality Test for more details). [B][U]Show errors limits[/U][/B]: This setting allow to select how graphs will be seen in the “Disc Quality” tab in the main window. To explain this option, it’s easier to use images as examples. Each burner executes a Quality Test in a different manner. Max error value considered as acceptable vary according the error measuring method used. For example, in Liteon drives all errors comprised in the interval between 0 and 4 are considered acceptable; all errors comprised in the region between 4 and 9 are bad, but still acceptable; all errors over 9 are unacceptable. Checking this option, CD-DVD Speed will show in different colors these intervals, and make it easier to evaluate a scan with a quick look. Unchecking this option, the graph will have an uniform background color (or a gradient if this option was selected in color options, as explained below). [B][U]Show statistics[/U][/B]: When a test is completed, the user can select if CD-DVD Speed must show a summary of test statistics (see pic). Unchecking this option, statistics will not be shown. [B][U]Show disc label[/U][/B]: By checking this option, in the “[B]Disc Quality[/B]” window, the disc label will be shown. Unchecking this option, label is not shown. [B][U]Quick Scan[/U][/B]: Quality Test can be executed in two modalities: full (or complete), and quick. Options to select if CD-DVD Speed must run quick or full scan are localized in the “[B]Quality Test[/B]” window. Here there are only options regarding [B]how[/B] the quick scan must be executed. Quick scan tests only some part of the disc, and not all disc, so this test is faster, but also less precise than the full scan. [B][U]Measure points[/U][/B]: Quick scan consist in do scan only in some segments of the disc. User must select how many points of the disc must be tested changing this setting. [B][U]Sample length[/U][/B]: This setting is the length of each segment to be scanned. To explain better these options, see the following schematic pictures. In first example, are selected 20 segments, each with a size of 5 MB. In this way, the disc will be divided in 20 parts, and 20 segments of 5 MB will be scanned. The green squares are the segments of disc that will be scanned; white zones are ignored. The green square in the upper part is the full scan (to compare with the quick scan). In second example, are selected 5 segments, 20 MB wide. In this way, the disc is divided into 5 parts, and in each part will be scanned a segment of 20 MB. Again, the green square in the upper part is the full scan (to compare with the quick scan). [B][U]Graph Limits[/U][/B]: These options allow the user to select scale values of a graph. [B][U]Errors[/U][/B]: This option allow to select maximum value showed in scale of errors graph. [B][U]Automatic[/U][/B]: CD-DVD Speed modify automatically graphic scale according to maximum value of measured errors. Start values are 10 both for C1/PIE and for C2/PIF, but is an error above these values is measured, scale will be automatically changed to a higher value. [B][U]Locked[/U][/B]: The user select maximum scale value. Checking this option max value on the graph scale will be fixed to a precise value. If this option is selected, maximum value must be specified by user (see below). Usually the option “[B]Locked[/B]” is used by the user at the end of a Disc Quality Test. If the user is not satisfied by the scale of the graph, doing a right click on the graph it’s possible to open global options in this panel to manually change graph scale. [B][U]C1 Errors/PI Errors[/U][/B]: This setting is the maximum value that user must select if “[B]Locked[/B]” option is checked. This value is applied to C1/PIE graph. [B][U]C2 Errors/PI Failures[/U][/B]: This setting is the maximum value that user must select if “[B]Locked[/B]” option is checked. This value is applied to C2/PIF graph. [B][U]Maximum speed[/U][/B]: This setting is the max value showed in C1/PIE graph for reading/writing speed. These values must be selected by user manually, both for CD and DVD media. For CD media I suggest a value of 53, and for DVD a value of 17, to improve graph readability. [B][U]Colors[/U][/B]: In this panel it’s possible to customize colors of Disc Quality Test. Some predefined themes are available, but users can modify manually any available color. [B]Important[/B]: To manually change any color, it’s necessary to select the “[B]Custom[/B]” theme, or any color modification will be ignored. Again, I suggest not to change colors randomly, to avoid an unreadable graph. [B][U]Background 1[/U][/B]: Background color of the graph window. [B][U]Background 2[/U][/B]: Checking this item, background color will be the one selected in previous option and will be progressively shaded to the color selected in this option. Unchecking this item, background color will be uniform, the one selected in previous option. [B][U]Show horizontal grid[/U][/B]: Checking this option will be shown horizontal grids. Unchecking this option, horizontal grid will not be shown. [B][U]Show vertical grid[/U][/B]: Checking this option will be shown vertical grids. Unchecking this option, vertical grids will not be shown. [B][U]C1/PIE[/U][/B]: The color of the C1/PI Errors in the graph. [B][U]C2/PIF[/U][/B]: The color of the C2 Errors/PI Failures in the graph. [B][U]Jitter[/U][/B]: The color of jitter in the graph (only for burners that support this function). [B][U]Read speed[/U][/B]: The color of read speed curve in the graph. [B][U]Write speed[/U][/B]: The color of write speed curve in the graph. 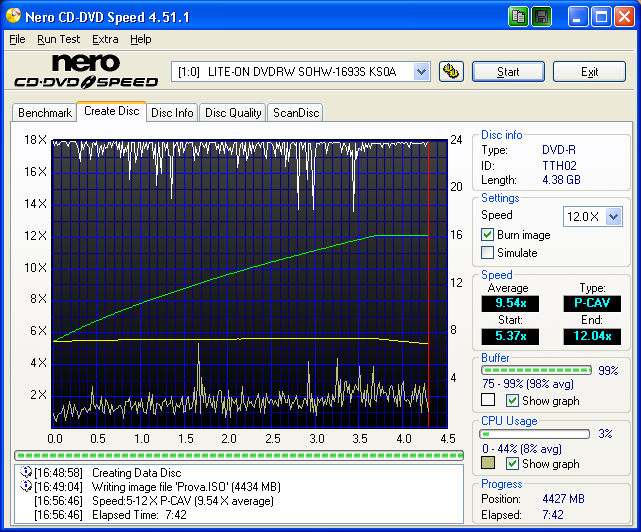 This curve is showed only if in “[B]Transfer Rate[/B]” panel of global options of CD-DVD Speed is selected the option “[B]Include Data Test[/B]”. 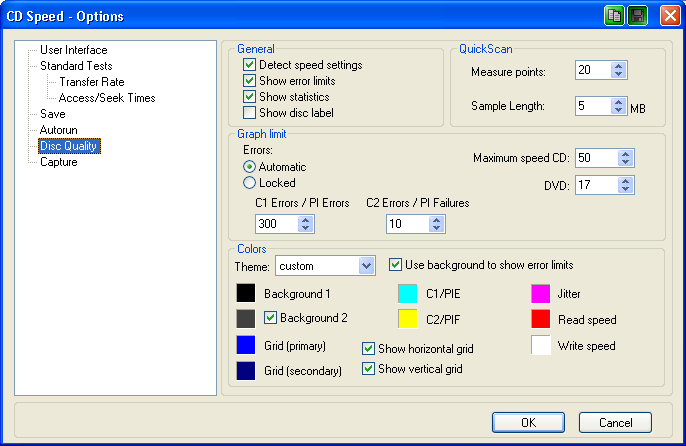 These options are related to screen image capture function of CD-DVD Speed to save test results. [B][U]Capture to clipboard button[/U][/B]: Checking this option CD-DVD Speed will show the little button on the window bar with “[B]Copy to clipboard[/B]” function (number 1 in the pic). Unchecking this option, the clipboard button will not be shown. Pressing this button all the content of the main window is copied to the clipboard, and can be pasted to any graphical software to save and/or modify images. [B][U]Capture to file button[/U][/B]: Checking this option CD-DVD Speed will show the little button on the window bar with “[B]Save as[/B]” function (number 2 in the pic). Unchecking this option, the Save button will not be shown. [B][U]Show file dialog[/U][/B]: Checking this option, after pressing the [B]Save[/B] button will be opened a dialog window to ask user to select a folder in which save images. Unchecking this option, all images will be saved directly in a predefined folder (see below how to select the predefined folder) with the automatically generated file name. [/li][li][B]Tagged Image File Format[/B] (.tiff). [/ul]I suggest using [B]PNG[/B] format. [B][U]Folder[/U][/B]: The folder in which all pictures are saved by default. To manually select a default folder, it’s sufficient to press the little button pointed by the red arrow. A preview is showed, so the user can know the automatically generated name in real time. If “[B]Show file dialog[/B]” option is checked, the user can manually modify the automatically generated file name and the folder in which save files. If “Show file dialog” is unchecked, all images will be saved directly in a predefined folder (see below how to select the predefined folder) with the automatically generated file name. [B]Important[/B]: To avoid files overwriting, I suggest also the use of date and time ([B]%D[/B] and [B]%T[/B]) as parameters for automatically generated file names. Alternatively, it’s better to select the option “[B]Show File Dialog[/B]” and select manually file names. If no parameter is selected, file names must be inserted manually by the user. Basic tests are the ones listed in “[B]Standard Tests[/B]” panel of global options of CD-DVD Speed, and are executed in the “[B]Benchmark[/B]” tab of the main window. There are two ways to execute these tests: singularly or all in sequence. 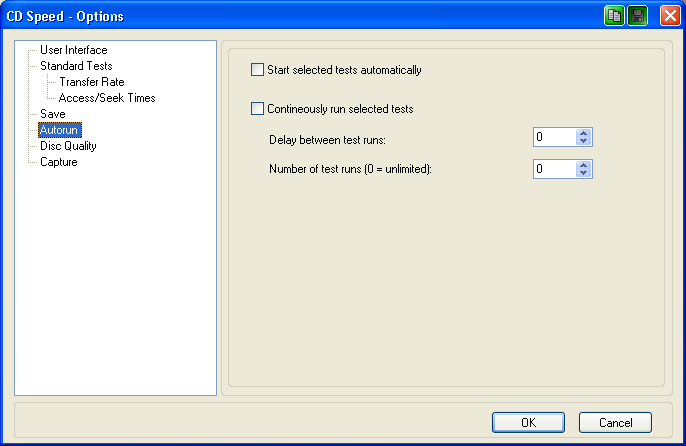 Each test can be selected singularly from “[B]Run Test[/B]” menu. To execute tests in sequence, the first thing to do is select, in global options, which tests must be ran. Then, it’s sufficient to press the “[B]Start[/B]” button. As seen in introduction, there are five tabs in main window. Here will be given only a list of these parts, but each will be described in detail in its dedicated section. [B][U]Benchmark[/U][/B]: The section dedicated to all basic tests. This interface is pretty much the same in all versions of CD-DVD Speed. [B][U]Create Disc[/U][/B]: Starting from version 4.50, was introduced a new section that allows the user to execute a little improved writing disc test. However, the “classic” writing test can be still executed in the “[B]Benchmark[/B]” section. [B][U]Disc Info[/U][/B]: Show some detailed informations about media loaded in the drive. [B][U]Disc Quality[/U][/B]: The section dedicated to quality test of burned media. Often this test is also called “Scan”. [B][U]Scan Disc[/U][/B]: The section dedicated to a little different quality test of media. [/li][li]To test a burned media (CD or DVD)[/ol]If the main purpose is to test a drive, can be used some special discs containing standard defects, like A-BEX discs. If the main purpose is to test a burned media, the test is aimed at verifying that burning was done correctly and that the media is readable and all data retrievable. In this test are showed two lines. If colors were not modified by the user, there will be a green line that represents transfer speed, and a yellow line that represents disc rotation speed in revolutions per minute (RPM). In the bottom scale there is disc capacity, in Megabytes (MB) for CD media and in Gigabyte (GB) for DVD media. In the left scale there is reading speed, and in the right scale there is disc rotation speed (in RPM x 1000). Under the graph there is a little window containing some extra informations on running tests. For example are reported date and time, test type, reading type, etc. [B][U]Current[/U][/B]: The current speed during test execution. When test ends, this box changes name and becomes “[B]Average[/B]”, i.e. the mean value calculated from maximum and minimum values recorded in the entire test. [B][U]Start[/U][/B]: The lowest speed detected in the entire TRT. If the reading curve is regular, this value is the same of the starting speed; if the curve is irregular, this is the lowest value recorded in the entire test (see picture). [B][U]End[/U][/B]: The highest speed detected in the entire TRT. If reading curve is regular, this value is the end speed; if curve is irregular, this is the highest value recorded in the entire test (see picture). You can see in that picture with an irregular graph, that TRT starts around 7x speed, and ends around 9x speed. In the [B]Start[/B] box is shown 1.83x and in the [B]End[/B] box it’s reported 13.89 x. These are, respectively, the minimum and the maximum detected speeds in the entire TRT. These values are used to calculate the “[B]Average[/B]” speed. [B][U]Type[/U][/B]: TRT doesn’t measure only [I]reading speed[/I], but also the [I]reading type[/I]. There are different modes to read a disc. To understand these modes, it’s important first to describe some basic notions: “Linear Speed” and “Angular Speed”. In this image the black arrow is the optical pickup route, and the three blue arrows are three different parts of the disc. Each blue arrow represent a segment of a disc track read by optical pickup. All segments run along the same [B]angle[/B], in our example 90Â°, but from the image is clear that segments (tracks) in the more peripheral parts of the disc run along a longer [B]linear distance[/B]: 1 cm inner track, 5 cm intermediate track, and 10 cm external track. In the picture all values are given only as an example, and are not absolutely exact. “[B]Angular speed[/B]” is the amount of [U]angle[/U] ran along in the time unit when the disc rotates. If a disc rotate at a constant speed, [U]angular[/U] speed is constant too, because every part of the disc run along the same amount of angle. “[B]Linear speed[/B]” is the amount of [U]length[/U] ran along the time unit when disc rotates. If disc rotates at a constant speed, linear speed vary according the distance from the center of disc. The most inner parts of the disc, near center, run along the shortest distance, and then have the lowest [U]linear[/U] speed. The most external parts of the disc, instead, have the highest [U]linear[/U] speed because they run along the longest distance. In optical drives, disc reading starts from the center and goes externally when pickup is moved along a radius of the disc (the black arrow in the picture). If rotation (angular) speed is constant, the most internal tracks run at the lowest linear speed (i.e. are read at the lowest speed), and linear speed increases progressively toward the external parts of the disc (i.e. reading speed increases toward the external). Optical drives can use four different reading types: CLV, CAV, P-CAV, e Z-CLV. [B][U]CLV (Constant Linear Velocity)[/U][/B]: Reading speed is constant in all disc parts. This means that when a disc rotates tracks run along the same linear distance. Consequently, when optical pickup moves toward external parts of disc, rotational speed is reduced progressively. [B][U]CAV (Constant Angular Velocity)[/U][/B]: Rotation speed is constant and reading speed increases progressively from the center toward external parts of the disc. [B][U]P-CAV (Partial-CAV)[/U][/B]: Rotation speed is constant and reading speed increase progressively up to a certain value. From here, reading speed remains constant, and rotation speed decreases progressively. [B][U]Z-CLV (Zoned Constant Linear Velocity)[/U][/B]: Usually this type is used for writing on a disc more than reading. In this type, writing speed is constant for a given segment of the disc, then increases to write another segment, and so on up to the end of disc. In each segment, linear (writing) speed is costant, and angular (rotation) speed is progressively reducing; at the end of first zone, rotation speed is increades to allow writing at a higher speed, and so on up to completion of disc writing. In “[B]Benchmark[/B]” window, after inserting a disc in the drive, are showed two other pieces of informations: disc type and its capacity. For example, inserting an audio disc in these boxes will appear “[B]Audio CD[/B]” and disc duration. Inserting a video DVD, will be showed “[B]DVD-Video[/B]” and disc capacity in GB. 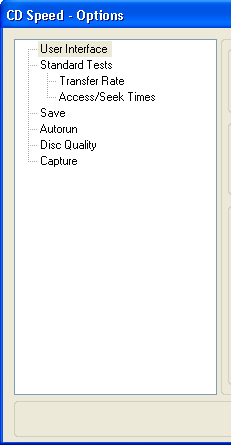 Inserting a burned disc, according to selected settings in global options of CD-DVD Speed, will show the disc type (+R/RW, -R/RW, blank media) or disc booktype (+R/RW, -R/RW, or ROM). To avoid confusion, remember what settings were selected. If in options is selected to show disc type, a +R disc with changed booktype to ROM will be still showed as +R. Finally, according to the disc type loaded in the drive, the Transfer Rate Test will show different results. [B][U]Data disc (CD or DVD)[/U][/B]: TRT measure data reading speed. If the data disc is a dual layer DVD, graph will show two more colored vertical lines. Red line is total disc capacity, and fucsia line is the layer transition. This latter line divides the graph in two parts, and each part is the the reading of a disc layer. [B][U]Audio CD[/U][/B]: TRT measure Digital Audio Extraction (DAE) Speed. [B][U]Blank disc[/U][/B]: inserting a blank media it’s measured the writing speed. Writing test will be described in more detail later. The “[B]DAE Quality test[/B]” measures how well the drive can extract audio tracks. This test is done in two parts. First some audio sectors are extracted to the HD at three different locations on the CD. The same sectors are read again and compared to the sectors written to HD. Depending on the number of differences, the DAE quality will be rated from 0 to 10, where 10 means perfect DAE (no differences). Next CD-DVD Speed will try to determine whether the drive supports “[B]Accurate Streaming[/B]”. When accurate streaming is not supported the drive is unable to locate the requested audio location at any time. If your drive does not get a perfect score with this test (10/10 and Accurate Stream checked) it is highly recommended to use a CD ripper with a verify function to extract audio tracks. One of the best CD rippers is Exact Audio Copy. This test measure access and seek times. [B][U]Random[/U][/B]: Optical pickup is moved in a random position on the disc. [B][U]1/3[/U][/B]: Optical pickup is moved from the start of the disc to 1/3rd of the length of the disc. [B][U]Full[/U][/B]: Optical pickup is moved from the start of the disc to the logical end of the disc, i.e where are located the last data of the disc. The term “[U]logical end[/U]” is used because not always the end is in the most external part of a disc. For example, in a disc burned only for half of its capacity, the logical end is where the last data is located, and not in the most external part of the disc, that instead is empty. [B]Remember[/B]: Executed test must be selected in global options of CD-DVD Speed. What are exactly seek and access times? In [B]Seek Time test[/B] is measured the amount of time necessary to move optical pickup to a specified position on the disc. In [B]Access Time test[/B] is measured the amount of time necessary to move optical pickup to a specific position on the disc [U]plus[/U] the time necessary to read a single sector. Then, access time is always higher than seek time (usually a few milliseconds). Again, [B]remember[/B]: in global options must be selected how many times to execute this test. This test measure CPU utilization at 1X, 2X, 4X and 8X. The Burst Rate Test measures the transfer rate from the host adapter to the drive. Usually an optical drive is connected by the proper cable to the IDE channel of mainboard. In this situation Burst Rate test measure speed transfer of IDE channels. However, it’s also possible to connect a drive with different interfaces. For example, it’s possible to use an IDE to UDB or IDE to Firewire adapter. in this situation, the Burst Rate test will be useful to determine if the adapter is enough fast to support high speed burnings (this is true mostly for DVD burners). [B]Important[/B]: results are accurate only if the drive caches the data. Since many drives don’t cache audio data it is recommended to run this test using data CDs. For high speed drives it is necessary to spin down the drive to lengthen the life of the optical parts. The spin down test measures how long it takes to stop the drive. The spin up test measures how long it takes before the drive can read data after it has stopped. Shorter times are better. Faster drives will have higher spin up/down times. This test will measure the time it takes for a drive to eject, load and recognize a disc. The time needed to recognize a disc depends on the type of disc. For example a drive needs much more time to recognize a multisession disc than a single session disc. The eject and load times should always be about the same regardless of which disc is used, because the drive requires the same time to open and close the tray apart from the disc inserted in the drive. This function will write predefined binary data in a selectable number of files on a blank media. Total file number written on the disc is variable, because data is added until the last sector which makes the disc very suitable to test the read performance, so a DVD will contain much more data than a CD media. While the disc is created the write performance is shown in the same way as the Transfer Rate Test (TRT). In this case, obviously, the graph is not the reading speed, but the writing speed. There is also a verify function available which checks the data just written on the test disc. This function must be activated in global settings of CD-DVD Speed. In versions previous to 4.50, the writing tests were available only in “[B]Benchmark[/B]” tab of the main window of CD-DVD Speed. Starting from the version 4.50, it’s available a new dedicated tab ("[B]Create Disc[/B]") to execute a writing test that allows to collect more informations than the “classic” test available in the Benchmark tab. Here will be described the “classic” writing test, and the new one will be described in the dedicated section of this guide. When executed in the Benchmark tab, the writing test will show in a graph writing speed and disc rotation speed. 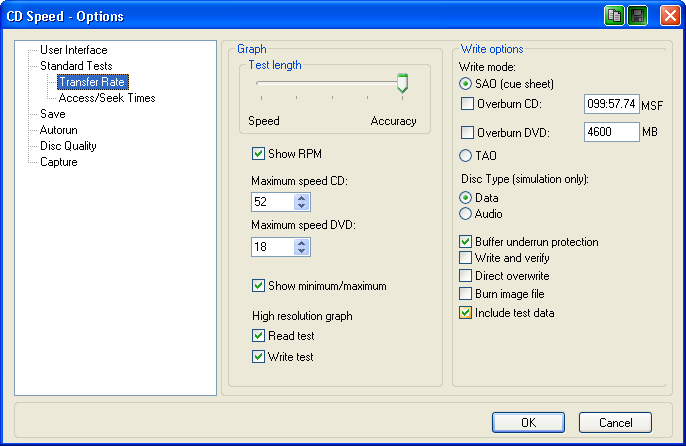 Disc rotation speed can be omitted by the graph unchecking the “[B]Show RPM[/B]” setting in global options of CD-DVD Speed (See [B]Options[/B] --> [B]Transfer Rate[/B]). The “classic” writing test can be executed in two ways, according the selected options (See [B]Options[/B] --> [B]Transfer Rate[/B]). [B][U]Create Data Disc[/U][/B]: This function will write predefined binary data filling the disc up to its maximum capacity. [B][U]Burn Image File[/U][/B]: This function will write the content of an image file (supported types are ISO and NRG) created by user. As already said, a verify function is available . If the user wants to use it, it’s necessary to enable it from the global settings. Verification results will be shown in the little window under the graph. In the “[B]Benchmark[/B]” tab, it’s possible to execute all basic tests. These tests can be executed singularly, or in a row. [B][U]Note[/U][/B]: saving only the screenshot will save only the graph, but results of all other tests will be lost. If more than one test is done, I suggest to save from the menu “[B]Save[/B]”. 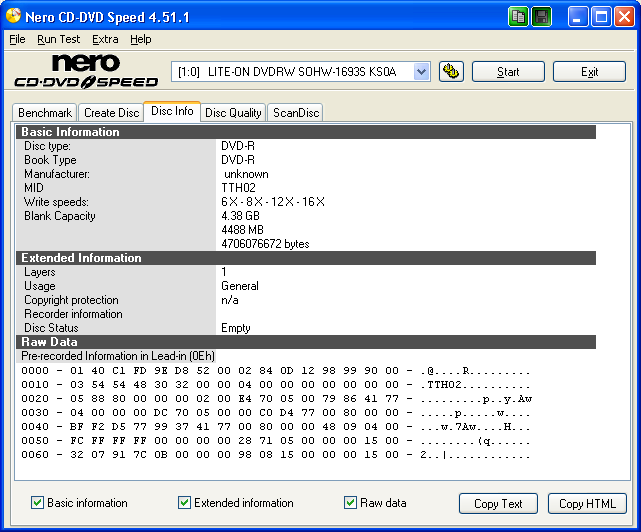 This tab was introduced starting from the version 4.50 of CD-DVD Speed. Basically it’s the same of the “classic” writing disc test of the Benchmark tab, but it allows the user to measure also some more data. In the classic test are showed only writing speed and disc rotation speed, whereas in the new test are showed also drive buffer and CPU utilization, both in the main window and in the plotted graph. Line colors in the graph can be customized by the user, as already said in the options section of this guide. [B]Important[/B]: All writing settings in global options of CD-DVD Speed are related to the “Classic” test of the “[B]Benchmark[/B]” tab. Except for color settings, all options of the new create disc test are located in the “[B]Create Disc[/B]” tab (see below for more details). [B]Important[/B]: To start this create disc test must be used the “[B]Start[/B]” button. Using commands in the “[B]Run Test[/B]” menu will be executed the “Classic” test, i.e. the one executed in “[B]Benchmark[/B]” tab and the graph will be not showed if the tab “[B]Create Disc[/B]” is selected. This interface is similar to the Benchmark one. In the upper part there is the combo box list to select the optical drive, the little button with gears to open global options, and two buttons, “[B]Start[/B]” and “[B]Exit[/B]”. Main part of the window contains the graph. The scale on the left is writing speed, the scale on the right is disc rotation speed, and the scale in the bottom is disc capacity. Under the graph there is a progression bar (green bar in the pic), and finally a little window showing some informations on the test. On the right of the graph there is a panel with various options and informations. Description of the right panel will be started from the higher part. [B][U]Disc info[/U][/B]: Show the disc type (+R/RW, -R/RW, RAM), mediacode, and disc capacity. [B][U]Settings[/U][/B]: This panel contain options that user must set to execute Create Disc Test. [B][U]Speed[/U][/B]: The writing speed that CD-DVD Speed must use to run test. Available speeds vary according the media used. These speeds are stored in burner firmware. [B][U]Burn Image[/U][/B]: If this option is [U]unchecked[/U], CD-DVD Speed will write predefined binary data in a selectable number of files on a blank media. Total file number written on the disc is variable, because data are written until the last sector which makes the disc very suitable to test the read performance, so a DVD will contain much more data than a CD media. Because data is written until the last sector which makes the disc very suitable to test the read performance, if the user doesn’t have an image file that matches the exact maximum capacity of a media (remember that +R and -R media have a slightly different maximum capacity), unchecking this option is the best way to test a disc at its full capacity. During disc writing, a graph is drawn showing four curves: writing speed, disc rotation speed, buffer level, and CPU utilization. If this option is [U]checked[/U], CD-DVD Speed will write the content of an image file created by the user. Supported types are ISO and NRG (the proprietary Nero Burning ROM image file format). If this option is checked, after pressing the start button CD-DVD Speed will ask to select the image file to burn on the disc. Writing test will start only after the image file is selected. [B][U]Simulate[/U][/B]: If this option is checked, CD-DVD Speed will not write any data on the disc, but it will do a simulation. Even if writing it’s not really done, CD-DVD Speed will record all parameters (writing speed, disc rotation speed, CPU utilization, and buffer level) and will create a complete graph. If this option is unchecked, the disc will be written really. Simulation can be useful to reveal bottleneck in the data speed transfer through the interface between computer and burner. This can happen, for example, if DMA is not enabled, or if the burner is connected through an IDE to USB (or firewire) adapter. If data source is an image file, simulation can reveal too frequent buffer emptying due to a heavily fragmented hard disc. Simulation can also reveal if there is an excessive CPU utilization. This can happen if DMA is not enabled or if there are some processes running in background during the burning (for example an antivirus). [B]Important[/B]: Simulation can be done only with DVD-R and CD-R discs, but not with DVD+R media. [B][U]Speed[/U][/B]: In these boxes are shown the test results. In the pic are shown there are two series of these boxes: on the left what appears before test start and on the right what appears after test end. Note that the first box initially show is named “[B]Current[/B]”, and at the end of the test is named “[B]Average[/B]”. [B][U]Current/Average[/U][/B]: During test execution, this box shows current writing speed. At the end of test it shows average speed, calculated from start and end values (see below). [B][U]Type[/U][/B]: The type of writing. The various types of writing (CLV, CAV. P-CAV, and Z-CLV) was already described in “[B]Benchmark[/B]” section of this guide. [B][U]Start[/U][/B]: Similarly to what is already described in “[B]Benchmark[/B]” tab, start is the lowest speed recorded during test execution. Ideally it’s the speed at which test started. [B][U]End[/U][/B]: Similarly to what is already described in “[B]Benchmark[/B]” tab, end is the highest speed recorded during test execution. Ideally it’s the speed at which test ends. [B][U]Buffer[/U][/B]: This panel show informations on buffer utilization during the writing test. A horizontal bar shows graphically buffer status. Next to the bar is shown numerically (as percentage of filling) the buffer status. Under the bar there are other numbers that refer respectively from left to right the minimum buffer level, the maximum buffer level, and the average buffer level. These values are updated continuously during the test execution. The little colored square shows the color used to draw the buffer line in the graph. This color can be changed by the user in global options of CD-DVD Speed. 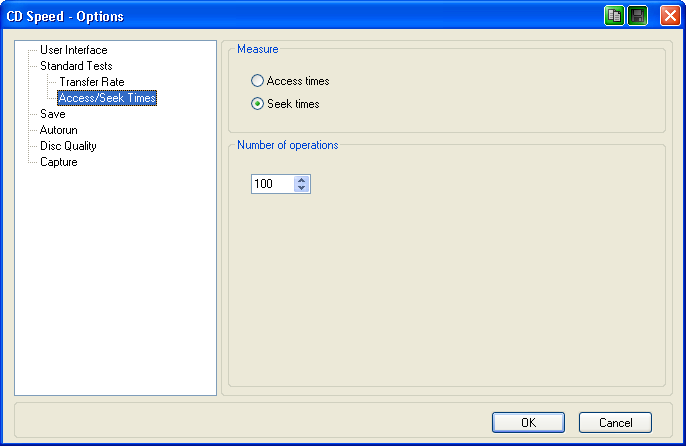 [B][U]Show graph[/U][/B]: By checking this option, the buffer graph will be drawn in the main window. Unchecking this option, buffer graph will be not drawn. [B][U]CPU Usage[/U][/B]: This panel shows informations on CPU utilization during the writing test. An horizontal bar shows graphically CPU utilization. Next to the bar is shown numerically the percentage of CPU utilization. Under the bar there are other numbers that refer respectively from left to right the minimum CPU usage, the maximum CPU usage, and the average CPU usage. These values are updated continuously during the test execution. The little colored square show the color used to draw the CPU usage line in the graph. This color can be changed by the user in global options of CD-DVD Speed. [B][U]Show graph[/U][/B]: By checking this option, CPU usage graph will be drawn in the main window. Unchecking this option, CPU usage graph will be not drawn. [B][U]Progress[/U][/B]: This panel shows in real time the current position of the disc during writing process, and the time past from the start of test. [B]Sidenote[/B]. Regarding times shown in this panel, there is a special consideration. If the user wants to burn an image file, (see later in “[B]Test procedure[/B]”), the user must press the “[B]Start[/B]” button, and then select the desired image file. Probably some people noted that after pressing the “[B]Start[/B]” button, the time counter starts too. Don’t worry: the time of the burning process will be measured only after the image file is selected. In fact, after selecting the image file, the time counter is resetted so the time shown here is the time required to complete the burning. If the user wants to burn a binary data disc, the time starts after pressing the “[B]Start[/B]” button. To execute the Create Disc test the procedure is as follows. Select the drive to use to do the burn. Save results in HDD from menu “Save” or pressing the little floppy button (number 2 in the pic) to save a screenshot in PNG file. In this tab of the main window it’s possible to visualize some informations on the media inserted in the drive. In this panel, experts can find many information. To explain all of this information it’s not the scope of this guide. Here will be described only some basic informations of CD-DVD Speed. More informations can be found in the CD Freaks Forum. [B][U]Drive and firmware[/U][/B]: As already said describing the main interface, CD-DVD Speed shows in all its tabs information on drive model and firmware installed. In this image, drive model is evidenced by the red square, and firmware by the blue square. In this example, we have a Lite-On SOHW 1693 with installed firmware KS0A. This is the most important part for most users. [B][U]Booktype[/U][/B]: Disc booktype (-R, -RW, +R, +RW, ROM). Remember that for +R/RW media booktype can be changed in ROM. [B][U]Manufacturer[/U][/B]: The manufacturer that produced the disc. Often is shown “unknow”. [B][U]MID (Media IDentification code)[/U][/B]: Often know also as “Mediacode”, MID is the code that actually identifies the media. This is one of the most important piece of information that the user needs to know. In fact, the brand on the box doesn’t say what the exact disc type is, and to say “[B]+R[/B]” or “[B]-R[/B]” it’s not sufficient. The same brand can sell media with many different mediacodes. [B][U]Write Speeds[/U][/B]: Here are shown all supported burning speeds for this media. This information is located in the burner firmware. So different burners can show different speeds for the same disc. [B][U]Blank Capacity[/U][/B]: This is the official disc capacity (when overburning is not used), i.e. how many data can be written on this disc. In our example: 4,38 GB (gigabyte) = 4488 MB (Megabyte) = 4706076672 bytes. Some other informations on the media inserted in the drive. [B][U]Layers[/U][/B]: How many layers there are on the disc. In dual layer media will be shown as 2. [B][U]Usage[/U][/B]: Some discs have specific usages. For example audio CD. Normal data discs will show “general” as usage. [B][U]Copyright Protection[/U][/B]: Here is shown if the disc is copyright protected. [B][U]Disc Status[/U][/B]: Here is shown the disc status, for example Empty, Closed, Open (for discs written in multisession), etc. Binary data pre-recorded on the disc. In the bottom of the window there are some options. [B][U]Basic Informations[/U][/B]: Checking this option, will be shown basic informations. Unchecking this information, basic informations will be not shown. [B][U]Extended Informations[/U][/B]: Checking this option, will be shown extended informations. Unchecking this information, extended informations will be not shown. [B][U]Raw Data[/U][/B]: Checking this option, will be showed raw data. Unchecking this information, raw data will be not showed. [B][U]Copy Text[/U][/B]: Pressing this button all informations read from the disc will be copied in the clipboard as plain text data. [B][U]Copy HTML[/U][/B]: Pressing this button all informations read from the disc will be copied in clipboard in html format. In this tab of the main window it’s possible to execute the “[B]Quality Test[/B]” of burned media. The main utility of this test is with burned media, but it can be executed also on pressed discs. [B]Important[/B]: Quality test can be done only with [B]burners[/B]; readers are not usable because they give unreliable results. Moreover, not all burners can do quality test. To provide a list of all burners able to do scans it’s really difficult; as a rule of thumb, all Lite-On and BenQ drives can do this test; also some Pioneer and some NEC burners can do quality test, but their reliability is rather variable. Plextor burners are among the best burners able to do quality test, but they are not supported by CD-DVD Speed (Plextor drives must use a proprietary software named Plextools). Often this test is also called “[U]scan[/U]”, but CD-DVD Speed allow to do another test named “[B]Scan Test[/B]” (see below in “[B]Scan Disc[/B]” section of this guide), so it’s rather easy be confused between these two tests. [B]Important[/B]: The main purpose of this guide is to describe CD-DVD Speed and it’s functions and not a discussion on significance and interpretation of test results. An accurate description on significance and interpretation requires a dedicated discussion because it’s really complex and rather controversial subject. So I’ll purposely avoid discussing the test interpretation. Those who are interested to know more on this subject can find a lot of detailed informations on the CD Freaks forum. The “[B]Disc Quality[/B]” tab shows an interface dominated again by a graph, and a lateral panel containing some settings and informations. Differently from other tabs, here there is no a single graph, but there are two graphs. The one above shows C1/PIE (respectively for CD and DVD media), and the one below shows C2/PIF (respectively for CD and DVD media). Each graph contains various information. [B][U]C1/PIE Graph[/U][/B]: The numeric scale on the left refer the number of C1/PIE Errors, the scale on the right refer the reading/writing speed, and the scale on the bottom refer disc capacity. [B][U]C2/PIF Graph[/U][/B]: The numeric scale on the left refers to C2/PIF errors, the scale on the right refers to jitter, and again the scale on the bottom refers to disc capacity. above the graph will be shown also the burner and the firmware used to burn the disc. selecting the “[B]Use Background to Show Error Limits[/B]” option in global settings of CD-DVD Speed. Under the graphs there are some panels showing in real time when the test is running some informations on disc quality. [B][U]PO Failures[/U][/B]: The number of PO (Parity Outer) Failures. These are the worst errors that can be detected on a disc. Usually POFs are indicative of unreadable data on the disc. On the right of graphs there are other panels containing more informations. [B][U]Disc Info[/U][/B]: Show informations on the disc tested. There is a special consideration regarding date. The value shown here is not the date when disc is tested, but the date when disc was created. If the disc was created burning an image file, then this label shows the date when the [U]image file[/U] ([B]ISO[/B] or [B]NRG[/B]) was created and not the date when disc was burned. For example, if the image file was created on 01-01-2000, even if the disc was burned on 01-01-2006 the date showed will be 01-01-2000. [B]Label[/B]: The disc label. As already said, it’s possible to avoid showing the disc label by unchecking the option “[B]Show Disc Label[/B]” in global options of CD-DVD Speed. [B][U]Settings[/U][/B]: In this panel there are all available settings to execute the Quality test. [B][U]Speed[/U][/B]: Very important, this box allows the user to select at which speed to execute the Quality test. The speed to select varies according to the burner used to do the test and the media tested. For CD media, with any burner suggested speed is “[B]Maximum[/B]”. For DVD media, selected speed is related to the burner. [B][U]Start[/U][/B]: This box contains the starting block from which Disc Quality test must be started. 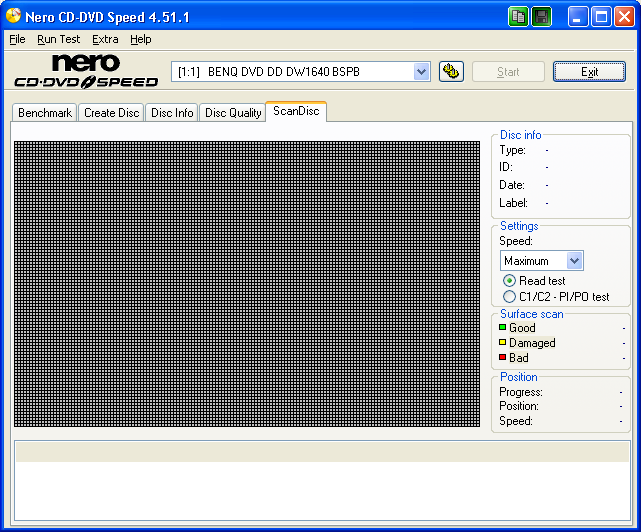 Selecting zero makes CD-DVD Speed start the test from the beginning of the disc. This value can be manually changed to start test from a desidered block of the disc. [/li][li]the disc is burned in overburning, so last block is over the latest official block. [/ol]Again, the user can select the end block manually. [B][U]Quick Scan[/U][/B]: Unchecking this option, Quality test will be executed on the entire disc. Checking this option, Quality test will be executed according to options selected for quick scan, as already described (see Options --> Disc Quality). [B]Important[/B]: Before executing a quick scan, it’s important to set correctly in global options of CD-DVD Speed how many measure points to scan and length of each point. [B][U]Show C1/PIE[/U][/B]: Checking this option CD-DVD Speed will draw a graph of C1/PIE. Unchecking this option, the C1/PIE graph will be not drawn. [B][U]Show C2/PIF[/U][/B]: Checking this option, CD-DVD Speed will draw a graph of C2/PIF. Unchecking this option, the C2/PIF graph will be not drawn. 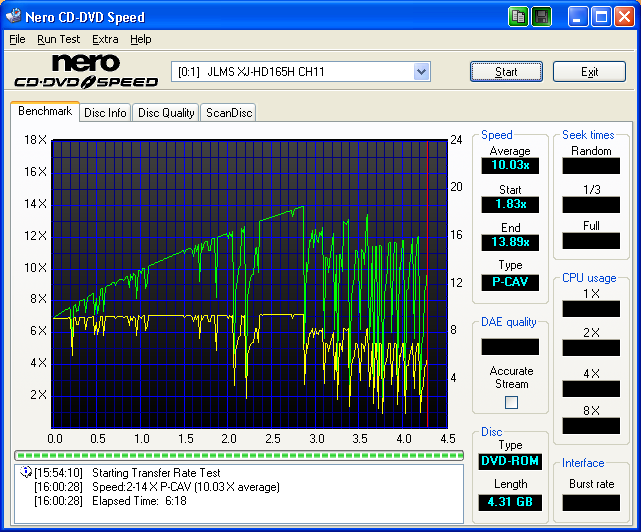 [B][U]Show Jitter[/U][/B]: Checking this option CD-DVD Speed will draw a graph of jitter. Unchecking this option, the jitter graph will be not drawn. As already said, not all burners are able to measure jitter. [B][U]Show read speed[/U][/B]: Checking this option, in the C1/PIF graph will be shown also a curve for scan speed. In the following picture, scan speed is the one drawn in red. As already said, the color of this curve can be customized by user (see [B]Options[/B] --> [B]Disc Quality[/B]). [B][U]Show write speed[/U][/B]: Checking this option, in the C1/PIE a graph will be shown also writing speed. In the following picture, write speed is the one drawn in white. If when disc was burned in the global options of CD-DVD Speed was checked the option “[B]Include Test Data[/B]”, writing speed was written in the disc during the burn. If the option “[B]Include Test Data[/B]” was unchecked, writing speed can’t be drawn because it wasn’t stored on the disc, so even if the option “[B]Show Write Speed[/B]” is checked, no writing speed curve will be drawn. The only exception to this is if the disc was burned some minutes before than Disc Quality test is executed, because writing speed curve is still in CD-DVD Speed memory. However, closing CD-DVD Speed after burning and before running Disc Quality test will clear memory, so again no writing speed curve will be showed. A score of 100% is a perfect disc, without C2/PIF errors (a very improbable event). Finally, in the lower right corner of this window there are some informations on the running test. [B][U]Progression[/U][/B]: The progression of the running test (the percentage of disc scanned). [B][U]Position[/U][/B]: The disc position being tested. [B][U]Speed[/U][/B]: The current scanning speed. Select the drive to use to run test. In this tab can be executed the “[B]Scan Disc[/B]” test. This test is a bit different from “[B]Disc Quality Test[/B]”, even if often this latter is called [U]scan[/U]. Again, main window is dominated by a graph. Graph represents a map of all disc sectors, and each sector is drawn with a little square. When test is running, each square (sector) will be showed in a different color according its status. [B][U]Red[/U][/B] for damaged sectors that contain uncorrectable errors (and then unreadable data). Above the graph can be drawn the burner and firmware used to test disc. As already said, this information can be omitted unchecking the option “[B]Include Test Data[/B]” in global CD-DVD Speed options. Under the graph there is a box showing more detailed test results. See below for more details. On the left there are some panels. [B][U]Disc Info[/U][/B]: Show informations on tested disc. [B][U]ID[/U][/B]: Disc [B]mediacode[/B]. See “[B]Disc Info[/B]” tab for more details. There is a special consideration regarding the date. The value showed here is not the date when disc is tested, but the date when disc was created. If the disc was created burning an [U]image file[/U], then this label show the date when the image file (ISO or NRG) was created and not the date when disc was burned. For example, if the image file was created on 01-01-2000, even if the disc was burned on 01-01-2006 the date showed will be 01-01-2000. [B][U]Settings[/U][/B]: Options to customize Scan Disc test. It is aimed to check file readability. CD-DVD Speed simply reads all files on the disc and reports all errors. Test results are reported both in the graph and, in a more detailed manner, in the box under the graph. As said previously, each square represents a disc sector, and sectors are drawn in different colors according their status. [/li][li]Test a burned disc[/ol]To test an optical drive can be used some special test discs containing standard defects, like [B]A-BEX[/B] discs. If the user wants to check a burned media, the Scan Disc Test is aimed to verify that burning was successful and that disc is readable in all its parts. Similarly to TRT, to test burned media I suggest to set test speed as “[B]Maximum[/B]”. in this way, discs will be checked in the worst conditions. If a disc passes the test successfully in the worst conditions, burning was done correctly. In the second part of Scan Disc test, it is checked quality (integrity) of each sector of the disc, and results are shown again in the graph. Green are integer sectors. Yellow are damaged sectors that can still be read thanks to the internal error correction routines of the drive, so data can still be retrieved. Red are damaged sectors, and unreadable. They should be the same of POF showed in Disc Quality test. The speed to select for this test is related to the media checked, similarly to Disc Quality test. For CD media should be selected “[B]Maximum[/B]” speed. For DVD media the speed should be selected in the same way for Disc Quality test, i.e 4x for Lite-On drives, 8x for BenQ, etc. Under the graph are shown some details on test results. To explain the significance of these parameters is out of the scope of this guide. Anyone interested can find more details in CD Freaks forum. Under settings panel there is another panel showing, in real time when test is running, some other test information. Here are reported in percentage all disc sectors: [B]Good[/B] (in green color), [B]Damaged[/B] (in yellow color), [B]Bad[/B] (in red color). In this section of the guide will be described all menus.